Este miércoles he querido rescatar del baúl de los recuerdos (o del fondo de mi armario) esta biker azul pastel que siempre ha sido de mis favoritas. Con un cambio bastante sencillo conseguimos convertir un look totalmente deportivo en un outfit perfecto para salir a tomar algo o a cenar. Y es que ahora que el knit (punto) se ha puesto de moda para cualquier ocasión ya no tenemos excusas para ir bien abrigaditas, ¿qué os parece? Nos vemos en mi IG & Snapchat @CCPetiteRobe muchos besos!! 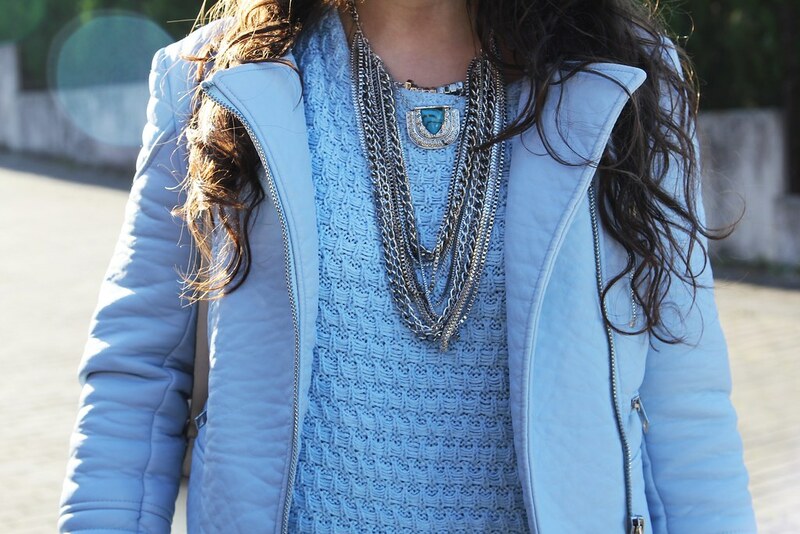 This wednesday I wanted to rescue to the memory lane (or the back of my closet) this blue pastel biker that has always been of my favorites. With a fairly simple change we get a totally sporty look make a perfect outfit for going out for drinks or dinner. And now that the knit (dot) has become fashionable for any occasion no longer have excuses to go sheltered well, what do you think? See you in my IG & snapchat @CCPetiteRobe lots of kisses! !